Donny McCaslin, is an alumnus of the Maria Schneider orchestra, The Mingus Big Band and trumpeter Dave Douglas’s quintet as well as other progressive groups. A versatile musician with a unique, edgy voice, he has acquired his own sense of composition and orchestration. On “Declaration”, McCaslin’s compositional mettle is revealed. He utilizes a format that includes a brass section of flugelhorn, French horn, trombone and tuba to compliment and extend the range of sounds he employs with his quintet. McCaslin declares the main theme with his sharp-edged saxophone. He plays the melodic prayer-like sentiment behind the processional sounds of his brass section. It is hard to discern precisely what kind of declaration McCaslin is making here, but the composition successfully projects a spiritual sense of reverence and enlightenment. Simon, Monder, Colley and Sanchez create an airy, cloud-like atmosphere upon which McCaslin’s horn can expand his proclamation. He does so with the carefully placed low register notes and an excellent use of space and time that validate a searching sincerity in his statements. McCaslin builds intensity by creating crescendos of sounds- at times purposefully shrieking- that he builds in a passionate display to a high register apex. The brass section re-enters for the reverential reprise as McCaslin restates the theme until it closes with a soft refrain of gentle piano and fading brass. 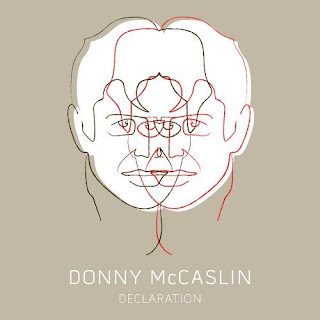 With “Declaration” McCaslin presents a complex and subtly different offering from this high-powered saxophonist’s usual fare. Labels: Donny McCaslin, Jazz Reviews, Review of Donny McCaslin's "Declaration"